Seqster's aggregation allows for improved care now, as well as the ability to pass on Alzheimer's care data to future generations of the family, opening up invaluable resources to the research community. 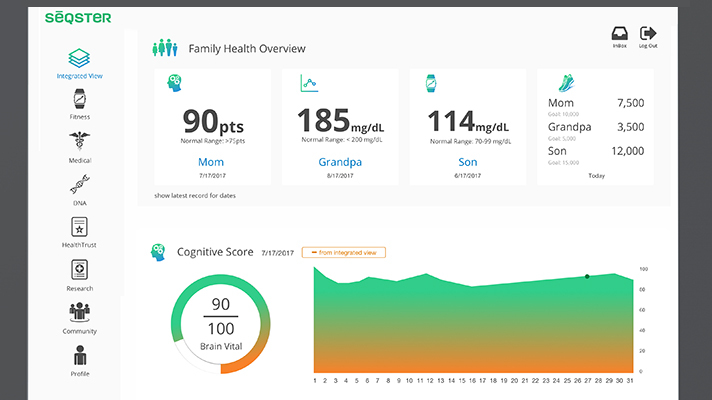 George G. Glenner Alzheimer's Family Centers has partnered with healthcare startup Seqster to provide access to its health data platform with the aim of improving the Glenner Centers' care coordination and decision-making. The platform lets individuals aggregate and control all of their available health information, including electronic health record, wearables, ancestry and genomics data. The idea is to let patients and their families better navigate healthcare treatment and share highly valuable personal and family health data with providers and researchers. The Seqster platform currently connects with more than 1,000 healthcare provider organizations composed of more than 2,000 hospitals and clinics nationwide, with additional providers still coming online. To use the platform, a user connects via a website or mobile app to healthcare organization patient portals, wearables accounts, ancestry services accounts and genomics services accounts by selecting the organization or service then entering account credentials into the platform. The platform pulls together the data from all the organizations and services into one database, allowing providers, researchers and family members access to the valuable information on the Alzheimer's patient. In this way, providers can better plan for the care of the Alzheimer's patient, better plan for the care of family members (who retain access to the data throughout time) who may get Alzheimer's down the road, and allow researchers access to a treasure trove of data that can help them in their fight against Alzheimer's. "Our aim was to empower individuals to take full ownership of all of their health data, understand it better, and share it with others on their own terms," said Ardy Arianpour, Seqster's CEO and co-founder. "I see an immediate need for better ways to support day-to-day decisions as well as a longer term need to preserve and pass on valuable data to future generations for breakthrough discoveries." According to the Alzheimer's Association, more than 5 million people are currently diagnosed with Alzheimer's disease in the United States of America. In San Diego, home of Glenner Centers, 65,000 people live with Alzheimer's disease and more than 200,000 San Diegans are caring for a loved one with Alzheimer's; the disease is currently the third leading cause of death in San Diego, according to the Alzheimer's Association. The mission of Glenner Centers is to provide high-quality adult day care and support services to families affected by Alzheimer's, through innovative day care programs, family support, case management, crisis intervention, and family and community education, advocacy, and information. Through the new health data platform, the provider offers its participants and families an additional benefit and service that improves how they navigate their care experience, including instant access to medical record data alongside fitness, wellness, genomics and ancestry data, officials said. "I had the opportunity to understand from the technology standpoint something I had not realized until Ardy had explained it to me: Just like people have wills and property and money passed to their family, this health information does not transfer on to future generations," said Scott J. Tarde, CEO and executive director of George G. Glenner Alzheimer's Family Centers. "And that information is valuable. It opened my eyes to understanding how important that is." With regard to Alzheimer's and the research opportunity that needs to be explored and how valuable that unidentified data is to researchers, being able to preserve that information and giving the option to let researchers access it is a valuable service for Glenner Centers patients and their families, Tarde added. Accelerating precision medicine to the point of care in is focus of summit in Washington, D.C. May 17-18, 2018.